"3LA1, V-255" by Timothy K. Perttula and Robert Z. Selden Jr.
DECORATION: The rim has several closely-spaced rows of stamping, and the vessel body is almost completely covered with closely-spaced fingernail impressed or stamped rows; there is a single horizontal trailed line near the vessel base. Arcing across the vessel body and the fingernail impressed-stamped decoration is a trailed hooked arm scroll with adjacent upper and lower curvilinear scrolls. 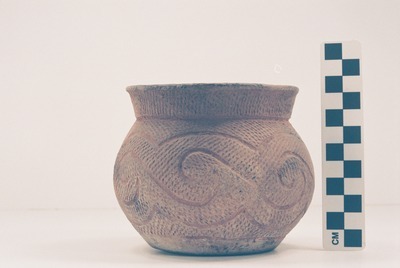 Cowhide Stamped jar (5425-638) from the Battle Place.